Solutions by Text, LLC (SBT) is a Dallas, TX based company populated by business consultants educating companies how to legally add a text messaging ingredient to their customer communication recipe. SBT has developed market-leading software meeting all regulatory requirements for texting, even in the debt recovery market. Our InterProse ACE customers send fully compliant text messages to their consumers when they meet specific criteria. But never fear, if you choose to incorporate text messaging into your communication strategy with SBT, the criteria for inclusion are clearly set out for you. Rest assured, SBT is as concerned with meeting compliance guidelines as you are. Texting has emerged as the preferred method of communicating for account notifications, payment reminders, past due alerts, text payments, collections, marketing/promotions, customer service and much more. SBT’s focus is providing the ability to evaluate and improve their clients' texting strategies, design sound implementation road maps and stay connected with this powerful communication tool. Is Rick Perr, 2017/18 ACA President, high enough on the ladder? Solutions by Text, in a very responsible effort to provide clarity and guidance for their customers (and ours! ), asked Rick Perr's firm to research the topic of debt recovery agencies utilizing text messaging to communicate consumers. 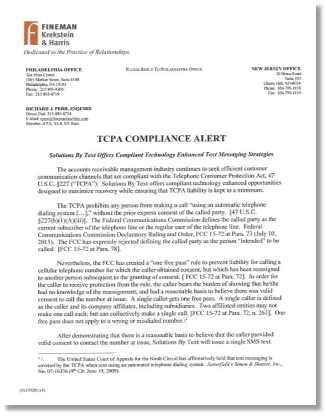 A White Paper titled, "TCPA Compliance Alert" is the result, and it is worth the time to read and digest. Click on the image at LEFT for a free copy! We don't want to give away the punch line, but a major take-away is text messaging is not only a permitted method of communication with your consumers, but the official determination from an attorney who is also the chief executive in the ACA leadership structure says debt recovery agencies may send a single unsolicited text message as an opt-in notification under the "one free pass" rule. There are rules, to be sure, but you can be as confident as we are that you are compliant with Solutions by Text as your partner.